Fremont will never be mistaken for an outdoors mecca – you either dodge the throngs at Lake Elizabeth or trudge to the top of Mission Peak – but there’s one often-forgotten gem on Fremont’s fringes that’s always worth a visit. Hours: 8 a.m.-8 p.m. April-October, 8 a.m.-6 p.m. October-April. Visitors Center: Open 9:30 a.m.-5 p.m. Tuesdays through Sundays; includes Possum’s Pocket Nature Store and exhibits portraying the life and culture of the Ohlone Indians, original inhabitants of the area. Pets: Dogs must be leashed. $2 dog fee (guide/service dogs exempt). Camping: Groups can reserve the Dairy Glen area. Call the East Bay Regional Park District at (510) 636-1684 two weeks in advance. Picnics: Tables and braziers near the Visitors’ Center and Quarry staging area. Trails: Marsh boardwalk, 3.5-mile Bay View trail for hikers and bicyclists, numerous single-track trails to hilltops. 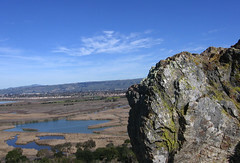 Nearby: Alameda Creek Trail, Don Edwards National Wildlife Sanctuary. How to get there: From Interstate 880, take Highway 84 west, exit at Paseo Padre Parkway and drive north. Turn left on Patterson Ranch Road. Where: The place is Coyote Hills Regional Park, which thousands pass every day on their way across the Dumbarton Bridge. Hardly anybody goes there: Local hiking and biking snobs sniff at the place – the hills are more like humps, and the trails have an unforgivable absence of giant redwoods. But let’s say for the sake of argument that you’ve got a friend who’s flabby, out of shape and needs someplace for a painless introduction to outdoor recreation. Your friend needs a nice view, pleasant ocean breezes, waterfowl quacking through marshes and gentle slopes that won’t require easy access to a defibrillator. Coyote Hills is that kind of place. Yeah, you can hear the whistle of traffic going over the Dumbarton. You can see sprawling Fremont to the east and Palo Alto to the west, and on a clear day, you can see all the way to downtown San Francisco. It’s not a remotely “wild” experience, but it is an oasis from all that civilization. It might be just what your friend needs to get a taste of the outdoors without having to travel to actual wilderness. What to see: For great views of San Francisco Bay, hike any of the single-track trails to the hilltops. They’re steep in places but mercifully short. For a closer-to-the-shore view, take the flat, paved Bay View Trail. For a longer trek, head over to the Don Edwards National Wildlife Sanctuary on the other side of the Dumbarton Bridge toll plaza. You’ll find shore birds galore there. For an easy, flat walk, check out the boardwalk through the nearby marsh, and follow the trail signs to the Ohlone Shellmound site, which includes a reconstructed tule house, shade shelter, dance circle and a sweat lodge. Check at the Visitor Center for information on touring the site. The scenery is ideal for nature photography. Birders will find enough flying creatures to keep them busy for hours. When to go Spring is the best time, when the hills are green and the wildflowers are sprouting. Winter can be cold and wet; summer can be hot and dry; fall can be cool and blustery. On weekdays you’ll have the place to yourself. Thanks for sharing, I like the article, pics, and map. I know some people who will appreciate this web page as great synopsis of the place. Makes me want to go back.